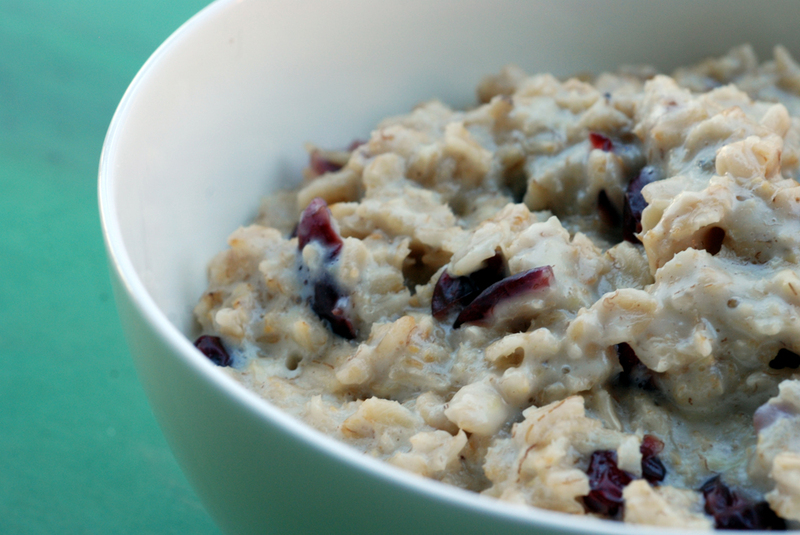 Rolled oats are no stranger to the breakfast table and oatmeal is a regular standby in my morning routine. After the Nutrition Action Health Letter (aka the Consumer Reports of healthy foods), deemed Bob’s Red Mill Country Style Muesli their favourite, it became my new breakfast. 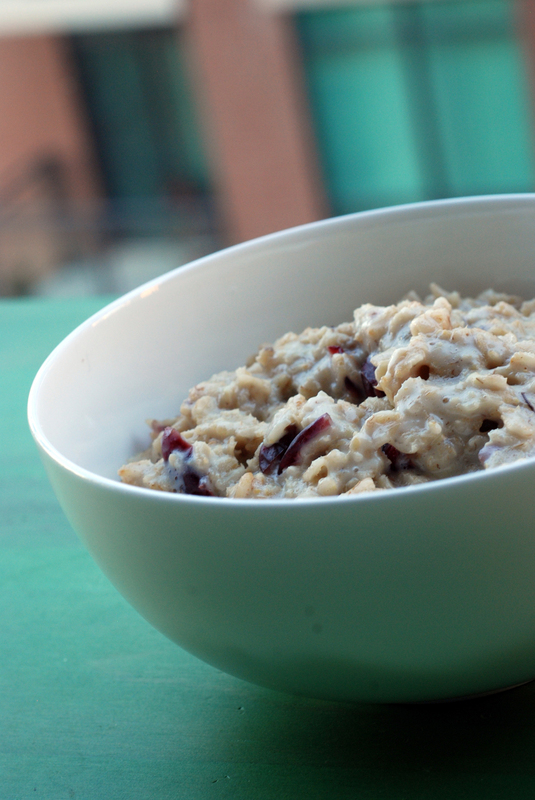 Oatmeal is cheap, healthy and relatively quick. It is great since it is a whole grain, fiber-rich, and lowers cholesterol. When you cook traditional oats, you also have no added sugar or salt (can’t say the same for the instant, flavoured varieties). But let’s be honest: when you cook rolled oats with water and a dash of salt, they aren’t that tasty. You can make oatmeal more flavourful by adding in your own sweeteners, fruit (dried or fresh), nuts, seeds, peanut butter, etc. The possibilities are endless. This recipe for whipped banana oatmeal is a great way to make a creamy bowl of oats without any cream at all. The magic comes from a ripe banana that melts seamlessly into the oats, imparting both sweetness and creaminess. It is a bit more involved than your standard bowl of oats, as you need to whip everything together, but it is worth it. I liked the addition of dried cranberries, but feel free to add in your favourite fixins. I spotted and then adapted the recipe from Macheesmo, who adapted it from Kath Eats’ Tribute to Oatmeal. This is my submission to this month’s Breakfast Club, featuring British breakfasts (the Brits call this porridge). This recipe, coupled with Peach Blueberry Raspberry Crumbles, is my entry to Blog Bites 7, Iron Chef-style, where we use one ingredient two ways! My ingredient: oats! 1. Combine milk and water in a saucepan over medium heat. When it starts to simmer, add in your oats, banana and chia seeds (if using). 2. Allow it to cook for 1-2 minutes, then add in your salt and vanilla . Now start to whisk it vigorously. Get comfortable because you will be doing this for a while. 3. After another 4 minutes or so, before the oatmeal is done, add in the cranberries. The oats will take 7-8 minutes on medium heat from start to finish to fully absorb the liquid, or until your desired consistency. I eat oats every day for breakfast and am pretty sure that they are the best thing since sliced bread. Although I have a feeling they came before sliced bread. So they are just the best thing. I love the idea of whipping banana into them for some extra creaminess and FLAVA! Delicious. Looks like another yummy recipe. I finally got a chance to try the Cranberry granola bars last night. They were amazing. Never another need to by another bought one…..sorry Kashi!! 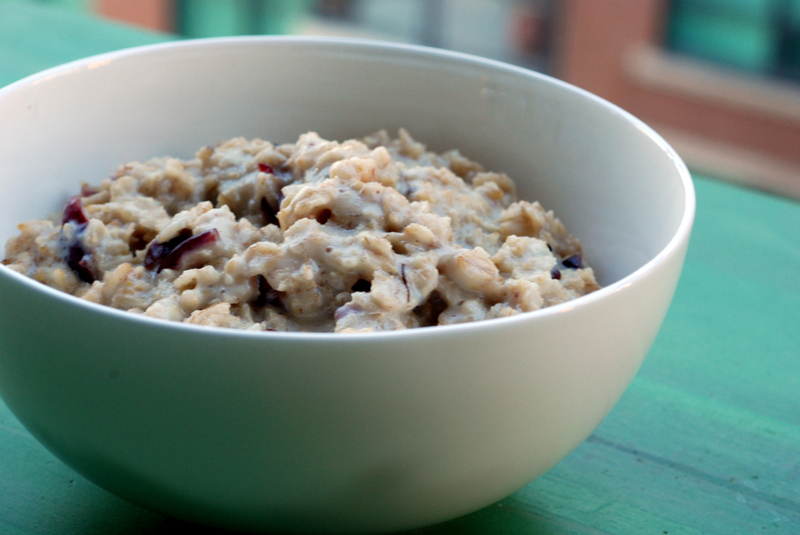 Do you ever use steel cut oats? They are particularly higher in nutritional value due to the fact that they are minimally processed, and thus also take longer to cook. I loveeeeeee them so much and always make them the night before I want to eat them. Just boil and throw the lid on and they do their thing. Give it a whirl for something new! No problem at all. Enjoy!